Bossa nova can be a very static style for novices- I’ve noticed in teaching that they have a hard time getting away from the standard, repetitive pattern. And, aside from Ed Uribe’s book, I really haven’t seen much in the way of methods for developing it. So here’s a page of exercises which will help to open up the bass drum part, and to become more flexible in general with this style. The usual place you would use the variations would be at phrase endings, or freely during the body of the tune, if you want a more open feel. I’ve written them in a two-measure format to give context, with the standard bossa pattern at the beginning and the variation at the end; in performance you would play the variations much more sparsely. It would be very unusual to play these exercises exactly as written (that is, as repeated two-measure vamps) in actual music. These will tend to give your bossa a little more funky and samba-like feel, which won’t be appropriate for every tune or situation. The bass drum is usually handled very delicately in bossa nova, so apply this with a lot of sensitivity. The variations can be treated somewhat as light fills, and played a little stronger than the body of the groove. Doing a lot of listening is vital, of course. 1. Play 8th notes with the RH on the closed HH (or cymbal, or on the SD with a brush). Optional: Play HH with foot on beats 2 and 4. 2. Experiment with accents on the second measure, particularly on beats 2 and/or 4, or on the &s. You can try opening the HH on the accented notes as well. 3. Play the variations at the end of four or eight measure phrases, or try them at phrase points in any tunes you happen to be working on. After you’re comfortable with that, you can begin selectively leaving out parts of the bass drum line from the hand part on the second measure. This should lead you easily into improvising rim click parts during the variations, and should help in integrating the exercises with a standard bossa groove. 5. 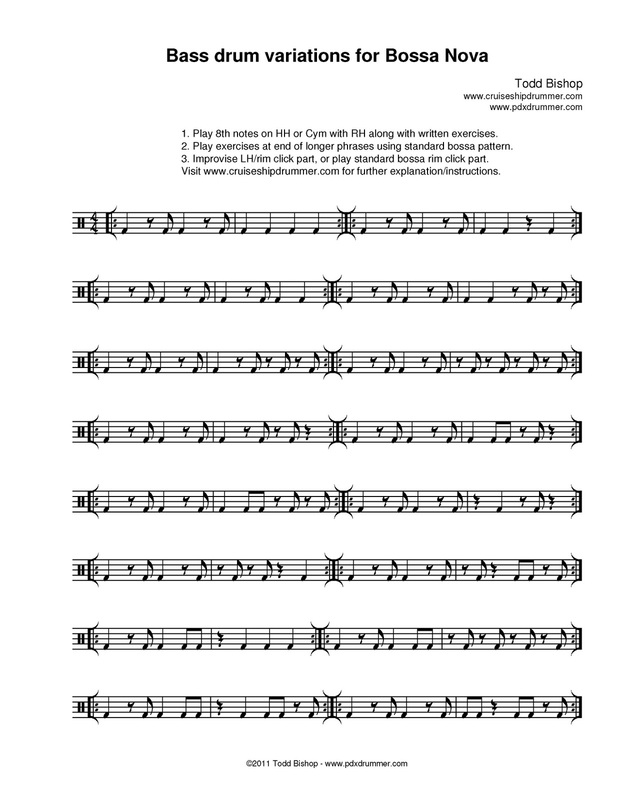 Play the exercises in cut time, applying any samba hand parts you may be familiar with.